Working in hand is an excellent way to improve communication with your horse from the ground and eventually this work translates to the ridden work. It can be beneficially applied for many different purposes no matter what age your horse is. It is also of benefit and adds value to any riding discipline. Work in hand is strengthening and very good to supple for your horse, a great way to help the horse warm up his muscles before you ride. It will allow you to see what “mood” your horse is in that day and also help your horse to get his mind focused on working with you. Furthermore it will allow you to identify any stiffness so you are able to help your horse relax those areas without the weight of a rider on his back. Working in hand is also an effective technique to allow your horse to “come down” after you have ridden, to let him stretch and relax his muscles, his whole body in fact. It is extremely beneficial for young horses to learn to cross over with the legs and therefore learning the lateral movements without the weight of a rider. This work can be started early in a horse’s education. Later when the young horse is ridden the aids for the lateral movements with a rider are naturally transferred from the in hand work to the rider’s aids. If your horse has back pain, has strained a muscle, got cast in stable or taken a fall in the paddock, work in hand can be a really effective compliment to your veterinarian, osteopath or massage therapist. You should, of course, always ask a suitable professional for advice if your horse is injured. To work and stretch the muscles on circles and in lateral movements is however beneficial for the horse and may help shorten his convalescence time. Did you know that Nuno Oliveira called shoulder-in “the aspirin for horses”? Nuno says working in hand begins in the grooming area. He maintains that grooming your horse is an excellent way to get to know each other better, find any tensions or extra sensitive areas in your horse’s body. Grooming builds trust, partnership and communication. Before you start working your horse in hand Nuno points out that with a young horse it is good to lunge a bit first, both to see how the horse moves, to let the horse release excess energy and to commence the working communication between you. 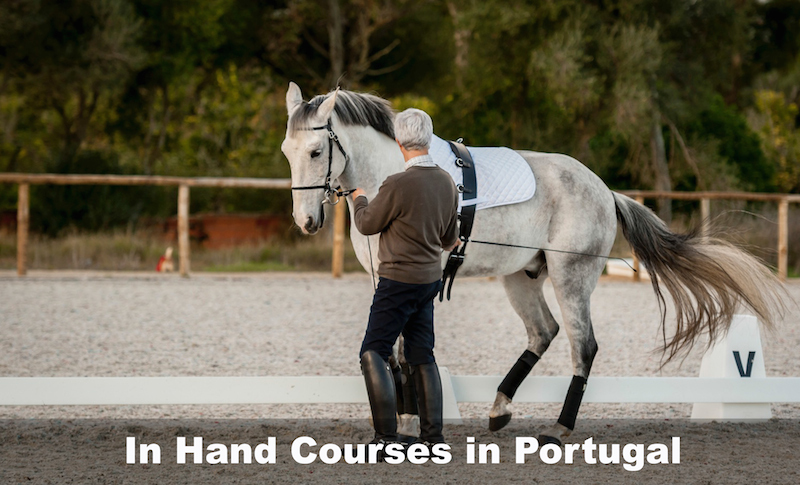 Nuno introduces horses to in hand work in a cavesson and the very first stage is to make sure that you can walk beside the horse’s shoulder, facing forward on both sides while controlling the pace. You need to be positioned a little bit further back than you normally would when you for instance are leading your horse to turn him out. 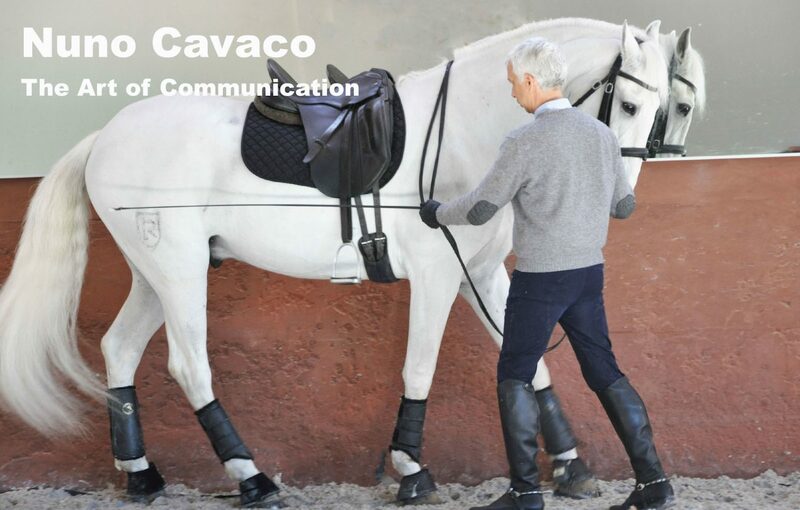 Nuno touches the horse gently with the whip to give impulsion when necessary and if the horse rushes away he uses the cavesson to bend head and neck to slow down the pace. Important here is that the horse do not lag behind you, run faster, walks into you or away from you but instead allows you take the lead positioned at his shoulder. Halt by twisting your body towards the horse, put the whip up on his crop and let the crop rest there. Try to make your horse halt in a square position, if not you can use the whip to tap on the hind leg that you wish your horse to move forward. Always pat and reward you horse verbally. Once you can control the pace, stop, go straight, make circles and turns towards both directions, positioned on both sides of your horse, you and your horse are ready for the next step. Now it is time to begin to teach the horse to step over by crossing the legs, in order to be able to begin the lateral movements. Nuno does this by walking on a 15 to 20 metre circle whilst giving the horse an inside bend. Notice that now you have to change your position slightly alongside the hand in which you hold the lunging rope. If you are on a circle to the left you hold the rope in the left hand, the whip in the right hand and are turned a little bit more towards the horse. With the bend you shall look for that your horse starts to put his inside hind leg a little bit more in and under his belly i.e he is no longer tracking. Nuno points out that a common misconception is that it is better if the horse comes in a faster, more forward walk, but, suppleness and correct muscle development does not come from speed, they instead come from slowly lifting, angling and putting down the hoof well under the belly. Keep the horse in a slow walk, yet with impulsion, don’t let him rush. Look at your horse’s back and loin muscles to observe that they are working correctly. The more confirmed your horse becomes in this work the more you can ask him to step in with his inside hind leg. The more established he is the more you can change your position, facing both towards the horse and towards his hindquarters, positioned closer to his head or closer towards his hindquarters. Nuno points out that it is very important to think about how your body language and position influences the horse, his impulsion and bend. When your horse steps well in under his belly with his inside leg at both directions it is time to introduce the bridle. If your horse is young and in the stage of backing this is a super way to introduce rein contact. Put on a snaffle bridle with reins under the cavesson and keep the lunging rope on. Here the idea is the same that with the earlier work but now you also take, first only, the inside rein in the same hand as the lunging rope. Gently you give the horse guidance with the rein using the cavesson as support. It is important that the horse follows the rein when you open towards the inside. When the horse gives the bend you release, just as when riding. If your horse resists use the cavesson more to guide. When your horse is comfortable and follows the guidance you give with the inside rein it is time to pick up the outside rein too. Continue to guide your horse with the reins together with the cavesson until your horse understands the rein aids and takes soft contact with the bit. This text will soon be followed up with steps for introducing the basic laterals, shoulder in and leg yield.